Computer users have several options when they need to take notes. They can write the notes down on paper, try to remember the information, use a text editor, use a specialized note taking software, use a gadget that is displayed on the desktop, an online service like Google Keep, post the note in an email, or use a web browser add-on. That's lots of choices which all vary in how convenient, accessible and speedy they are. Sticky Notes is an interesting extension for the Google Chrome web browser that can be used to take notes directly in the browser. The main benefit of browser-based note taking extensions is that you don't need to switch to another program first to access notes if you need them predominantly in the browser. Sticky Notes requires no extra permissions; you can install it in Chrome by visiting the Google Chrome Web Store and clicking on the install button on the extension's page there. You find the link in the summary box below the article. The extension places an icon in the Google Chrome address toolbar that, when clicked, opens a text form that can be used to enter notes. 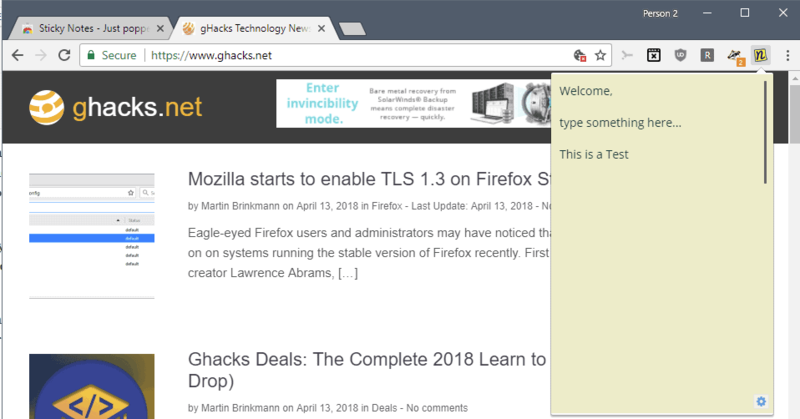 The Chrome extension supports plain text notes only which means that you don't get any formatting options or support for HTML tags or BBcode. This is a limitation as you can't use it to create formatted lists, emphasize text, or create links that you can click on right away. Not all users may have need for those formatting options on the other hand. You can enter text manually in the extension interface or use copy and paste instead. The text is saved by the extension so that it is available in future browsing sessions. A click on the settings icon reveals some preferences: you may change the font and text size, or change the window size in the settings. Sticky Notes can be helpful for users who regularly work with the Google browser. The extension limits you to plain text notes and does not link notes to the active web page. It offers one notepad for all notes only which means that it is not suitable if you need to take lots of notes. The extension supports experimental sync functionality between different Chrome browser instances but the developers suggest to keep it turned off as it may lead to data loss. The extension lacks options to export notes using other means as well.